SENSA® was designed to work with your sense of smell to help trigger Sensory Specific Satiety. The scientific principle behind SENSA® is remarkably simple. As you eat, smell and taste receptors send messages that tell your body it’s time to stop eating. This is a phenomenon we call Sensory Specific Satiety. By enhancing smell, SENSA® Tastants were designed to help speed up the process and trigger your “I feel full” signal, so you eat less and feel more satisfied. Because SENSA® works with your body’s natural impulses, rather than against them, there are no feelings of hunger or intense cravings. Sensa is commonly referred to as The Sprinkle Diet, although the Sensa weight loss regime isn’t really a diet as such, but something you would add to your current diet. Sensa sprinklings are in fact flavor-enhancing ‘flakes’ made from maltodextrin, tribasic calcium phosphate, silicon dioxide, and flavorings. You simply sprinkle a dash over your food (as you would salt or pepper) and it then amplifies both scent and flavor. Sensa is actually meant to work using your sense of smell, tricking your brain and belly into thinking that you’re full. So does Sensa work then? Well, judging by the lack of scientific evidence and growing dreadful user reviews found on Amazon and other locations, probably not. And if you’re planning to buy Sensa, It is probably a good idea to do your homework as there seems to be talk of a Sensa weight loss billing scam as well. Of course, when you are taking in any weight loss supplement, your main concern is the side effects. So are there any Sensa side effects? Majority of side effects are caused by dangerous or toxic ingredients. Well, Sensa is not FDA approved but its ingredients are categorized as safe by FDA. In fact most of the ingredients are also used in food items like salad dressings, baby food and yogurt. 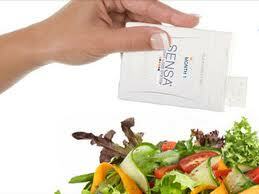 Sensa is also sodium-free, sugar-free, calorie-free, gluten-free and there are no drugs, stimulants or MSG. Majority of users have no reaction to Sensa but if you are allergic to the following, do not use this product. Lactose – Sensa may contain milk. Maltodextrin – It is one of the main ingredients of Sensa which made from cornstarch. Common reactions include hives or rashes. Carmine – A food coloring agent/ dye. It may cause mild hive, itchy skin and anaphylaxis. Other ingredients include silica, soy and tricalcium phosphate. Apart from probable allergic reaction, the following Sensa side effects are admitted by the company: stomach pain, gas, hives/ rashes, dizziness, swelling, loose bowels and difficulty breathing. However, there are ugly Sensa side effects that remain a secret to users. There are claims that Sensa has caused headache, dry mouth, nausea, constipation, intestinal blockage, rectal bleeding, gall bladder attacks, and kidney pains. The “unpublished” side effects are a lot more serious so if there is truth to this, perhaps it’s enough reason not to take risk. If any side effects occur, stop using the product and immediately consult your doctor. So, is it worth sprinkling this magic fairy dust on your food to try to lose weight??? The choice is yours but do your own research. Do you think it’s really a good idea to be able to eat all the fries you want with a little sprinkling of Sensa? Ok so let’s say you lose weight……….what are the fries doing to your health. The problem I see here is that people want to lose weight but don’t want to change a thing. They want to continue eating unhealthy food and have the pounds melt away. It doesn’t work like that. Just eat healthy and cut out all that crap and I’m pretty sure you will lose weight. Stick to lean protein sources, tons of veggies, a few servings of fruit, some whole grains, and some nuts and seeds and you will be surprised how great you can feel. I know, lot of you will say but veggies don’t taste as good as those french fries…………..search the internet for simple recipe ideas. I find that roasting my veggies makes them all taste yummy, so try it. Eat FAT to Lose Weight!